At Ingleside Animal Hospital, our primary concern is for the health and well being of your cat. Unfortunately, there may arise a circumstance when a surgical procedure is in the best interest of your feline friend, and in these times you will need to make that decision. We understand what that feels like, and our veterinarians and staff are here for you too. 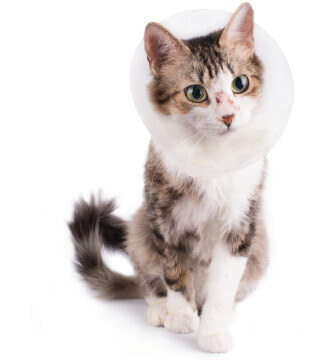 Listen carefully to post surgical instruction from your veterinary care team and call hospital if you have any questions regarding the post op care for your cat. Safe cat anesthesia requires that close attention be paid to the patient before during and after the anesthesthetic. At Ingleside Animal Hospital, we treat every cat according to its specific medical and surgical needs. Each anesthesia is tailored to each patient. We adhere to very stringent guidelines for administering cat anesthesia before, during and if necessary, after surgery. These guidelines come from the American Animal Hospital Association, a veterinary organization that only accredits approximately 12% of all veterinary practices nationwide. For example, the AAHA guidelines require that we first do blood work, and then depending upon your cat's overall health, other tests to ensure there is not an overt risk of complications from receiving cat anesthesia. If you need to discuss surgical options, or schedule surgery for your cat, please contact us today. Our veterinary staff is highly experienced and caring cat people who are happy to help ease the stress and fear associated with cat surgery for you and your feline friend.